I LOVE everything about flowers! I cannot live without them. I can’t resist photographing them and they are essential in my home. I have my favourites, big blousy peonies, wild English roses, sweet smelling jasmine, hyacinths that arrive with the spring, glorious gardenias and hydrangeas, reminding me of my childhood and my Nanna. Flower paintings have always been a favourite too, from the intricate detail of the Dutch masters to the broader strokes of the oversized blooms painted by Georgia O’Keefe. Today I spoke to Matthew Usmar Lauder about his passion for flowers and his beautiful flower paintings. Matthew’s flower paintings move me, each stroke is passionate. Matthew what is it about flowers? ‘I love flowers, I consider them to be some of nature’s greatest art. I also love their perfume, especially the rose, gardenia, and orange blossom. 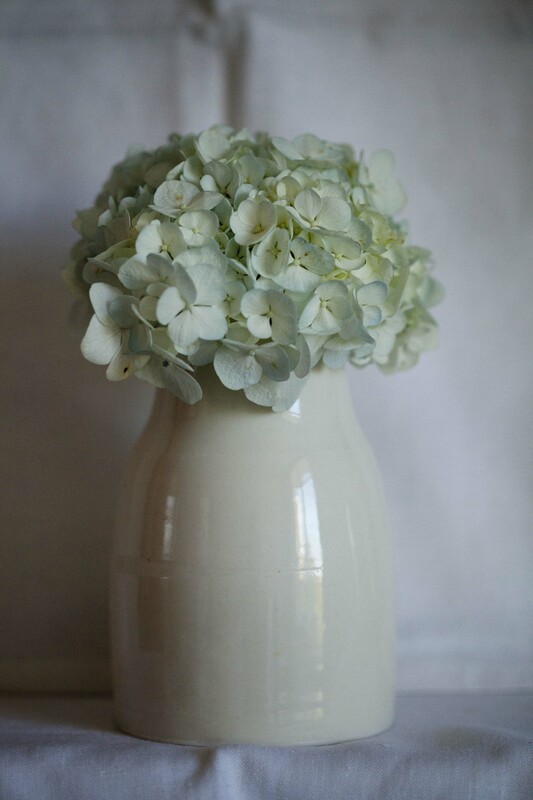 I adore the hydrangea. I didn’t get it when I was young, I’d see them and think of dull British suburban gardens or clinging to the sterile walls of care homes. But when I looked a little closer I got them. They are magnificent, ballsy, robust and ever so subtle in their glorious colour. They are a joy to paint their drama and sculptural dynamic is inspiring. Is your approach to flower painting different to other subject matter? I paint each subject in a way I instinctively feel is right. I find nature to be everything between chaos and effective balance, with that in mind I throw myself and my paint right in the middle. You are now producing prints of your fab flowers, what made you decide to do that? I made that decision based partly upon demand. In the past, I have sold practically every flower painting I’ve painted, (and some individual pieces I could have literally sold two or three times such was their popularity). Also, I have a love of printmaking which started as child when I was introduced to screen printing. Then later, after completing my Degree in fine art painting, I chose to do a Masters in fine art print making. The print reproductions I am having made now utilise the best of modern technology, which is thrilling because they are as close to the original as possible. Follow If you would love one of Matthews beautiful prints on your wall CLICK HERE and take a look. There are a variety available in different sizes. Usually the images I post of My Greek Island Home (check out my book) are in colour but Greek village life is just as beautiful in black and white. Enjoy my wandering around the village. What a great article on our village life in the August issue of UK House & Garden magazine. Beautifully written by Ros Byam Shaw and fabulous photos taken by Paul Massey. Thanks for coming to My Greek Island Home and sharing some of our favourite things. My Greek Island Home published in the UK by Clearview Books. My niece, Hannah came to visit on My Greek Island Home recently. The summer afternoon light was perfect in my bedroom and I could not resist using her as my muse. Thank you Hannah I hope you enjoyed My Greek Island Home. What a fantastic London spring night for great party! My Greek Island Home has now been published in the UK by, Clearview Books and was launched in London last Wednesday night. Despite the tube strike and Chelsea playing at home my trusty friends and followers turned up in droves. It was great to see friends both, old and new and also be introduced to some new faces. The venue was Nikki Tibbles Wild at Heart in Pimlico, a fantastic location. Nikki generously provided her beautiful shop overflowing with spring blooms and her and the girls, Ruth, Robyn, Sophie and Lucy were perfect hostesses. Domus Nova, Notting Hill’s best estate agent, very generously sponsored the event and kept everyone’s glasses topped up with prossecco, rose and white wine. The Grilling Greek parked his van outside and served up a feast, thrice-cooked chips, pita, hummus, olives and vegetarian souvlaki, it was all so yummy.Some of our Greek recue dogs, Robert, Maisy and April were able to make it to the evening which for me was the highlight .Clearview Books gave 10% of the money raised from the sale of the books to Nikki’s charity The Doghouse. ‘Want me’ t shirts designed by artist, Matthew Usmar Lauder to raise awareness and money for the rescue dogs were on sale too. I am blessed to have such great friends and supporters and thank you everyone for making the night a brilliant success.If you were not able to attend the night and would like to purchase a book you can go to Wild at Heart or online to amazon. It you want to support the dogs and would like a ‘want me’ t-shirt go to www.usmarstudio@bigcartel.com. Don’t forget to take a selfie in it and share. A shared selfie with the book would also be great.Below are some photos taken on the night by Rob Dawkins, thanks Rob! Matthew knows the small village streets on our GREEK ISLAND HOME like the back of his hand and I think he has now become familiar with every flowering rose bush too. I don’t know how people manage to grow fabulous roses but it seems we are the only people in the village incapable of it. Apparently they just grow there is nothing special we need to do and of course everyone has these flowering beauties in their garden. Everyone but us! But I need not fret as I am lucky enough to have roses picked for me from someone else’s abundnt crop. We do have a small amount of fruit trees providing us with seasonal delights. A quince tree is the first tree growing as you enter our small garden and although our annual crop seems to be far less than others in the village there is still something that can be used in a chicken staffado . There is also a small plum tree, set in the middle of our yard and an olive, fig and an almond tree too. These were not planted by us and were well established when we arrived probably planted by the wife of the last inhabitant, a priest. She was said to have had green fingers. There is an abundance seasonal fruit and veggies in the village and we are very lucky to receive bags of goodies which we usually find hanging from our front gate. This is always tricky as you don’t know which one of our many generous village friends has left it. Recently we received a bag filled to the brim with persimmons a fruit I must admit to never have eaten before. I really enjoyed this fleshy fruit and found myself unable to stop eating them once I started. I also used them in salads a delicious addition, they taste divine and add wonderful colour. We still have not worked out who left this gift but we are once again truly greatful. I could not resist setting up this still life today, a beautiful flower from Grandiflora a fabulous vase from Mosantimetre and soft linen napkins from The Stanley Supply Store. So exciting, on my dog walk today I saw the first poppies of the year! Whilst those of you in Northern Europe are freezing your sox’s off, here on ‘My Greek Island Home’ we are getting some lovely sunny days and at 18 degrees outside I can walk without a coat. In the garden hyacinths and camellias are opening up and along the track, leading out of the village there are tiny, tiny, delicate, deep mauve, wild flowers bursting up through the soil. Spring is here. I won’t shout to loudly as you never know when there could be a change. I don’t expect we are over the winter quite yet but I am enjoying these days a lot.